DENVER (Reuters) - Thousands of Denver public school teachers walked picket lines for a second day on Tuesday, disrupting classes for some 92,000 students as union and school district officials resumed contract talks that broke down over the weekend. 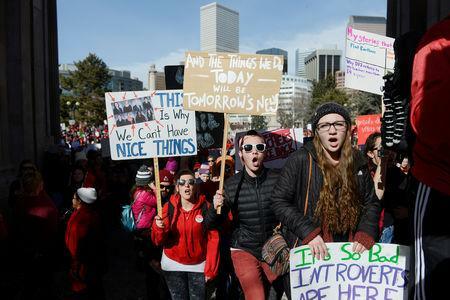 Talks in Denver broke down on Saturday, triggering the first walkout by teachers in Colorado's largest city since 1994. The two sides returned to the bargaining table late on Tuesday morning. "In Denver, we're losing teachers left and right," said McKeehan, who was holding a sign that read, "We'd rather be teaching." The Denver Public Schools district has said its latest proposal would raise teachers' pay by nearly 11 percent next year, while the union has called that figure inflated. On Monday, Public Schools Superintendent Susana Cordova told reporters that the district has already met many of the teachers' demands for simplifying their complicated pay structure. "We've made really significant changes already," Cordova said. "Many of the things I think that we hear our teachers complain about, actually aren't about the proposal that we've put on the table, it's about the current system. And many of those things I agree with as well." Denver Mayor Michael Hancock on Monday expressed support for the teachers' pay demands and offered to help mediate the dispute.